Gas Authority of India (GAIL, New Delhi; www.gailonline.com) has agreed to promote and provide support for a new 314 acre (about 128 hectares) plastics park to be developed at Auraiya in India’s Uttar Pradesh state. 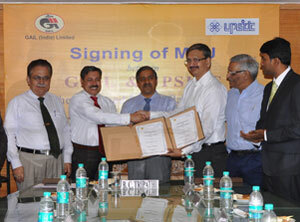 Under the Memorandum of Understanding (MoU) signed by GAIL with the state development corporation UPSIDC, the gas and petrochemicals company will supply raw materials at competitive market prices, provide technical support to plastic processors and establish a polymer warehouse. UPSIDC will provide the basic infrastructure, including land at “attractive prices,” as well as road transport, water supply and security for plastics industry companies interesting in setting up in the park. The development company also has signed a MoU with All India Plastic Manufacturers Association (AIPMA) to invite plastics industry companies to set up facilities in the park. UPSIDC will float a Special Purpose Vehicle (SPV) to finance the project, which it is hoped will provide business opportunities for plastics converters and boost the overall economic development of the region. GAIL said it is “in the advanced stages” of increasing HDPE/LLDPE polymerisation capacity at its Pata complex in Uttar Pradesh from 410,000 t/y to 900,000 t/y – see Plasteurope.com of 03.10.2008. Products are marketed under the trade names “G-Lex” and “G-Lene”. The new 500,000 t/y capacity is due to be on stream by fiscal year 2013-14. The company back-integrated into natural gas cracking operates what it says is the only HDPE/LLDPE plant in northern India. The Indian raw materials giant (28% of profit is generated by petrochemicals) has two 100,000 t/y trains of dedicated HDPE units using the Mitsui slurry technology and one 210,000 t/y HDPE/LLDPE swing plant using Novacor technology.